The end of the 1960s set the stage for Sugarloaf, as the cream of several Denver bands came together as Chocolate Hair. Keyboardist/vocalist Jerry Corbetta and guitarist Bob Webber of the Moonrakers (Denver’s most popular group during the middle of the decade), plus Bob Raymond on bass and Myron Pollock on drums, recorded demos that got Chocolate Hair signed to Liberty Records. 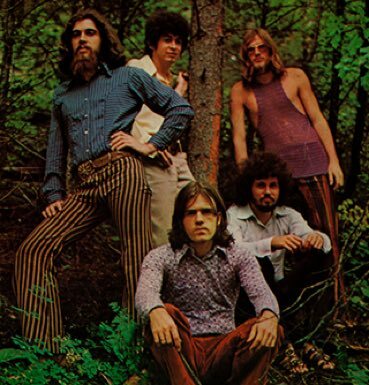 The seven-song demo, a mix of rock, R&B and jazz licks, became the basis for the debut LP, but only after new drummer Bob MacVittie came on board to record the last song for the album, which scored the band a big national hit—“Green-Eyed Lady” peaked at #3 in October 1970. Prior to the release of “Green-Eyed Lady,” there had also been a name change. Told by the legal department at Liberty that Chocolate Hair had racial overtones, the band took the name of a mountain summit in the foothills above Boulder where Webber lived, transforming the rock quartet into Sugarloaf. Non-stop touring gave the band little time for songwriting, so they invited Robert Yeazel from the Colorado band Beast to join on guitar and vocals. An edit of his “Tongue in Cheek,” a track on the second Sugarloaf album, Spaceship Earth, became a minor hit in 1971. An amusing song about the fickle music industry, the dance-friendly new track spelled out the CBS Records phone number and a general White House number—touch-tone style—for the world. Recorded with initial drummer Pollock back in the fold, “Don’t Call Us, We’ll Call You” by Jerry Corbetta/Sugarloaf became a hit, reaching #9 in March 1975.